The library was a cultural center for the community during the 1930s and 1940s. The Civic Club and the local Red Cross held their monthly meetings there. Other events were held in the building or on the lawn, including benefit bridge parties, Garden Club flower shows, glassware exhibitions, and afternoon teas for famous visitors, including New York Daily News writer Antoinette Donnelly and modern dance founder Ruth St. Denis. The year 1946 was an important year in the library’s history. Miss M. Elizabeth Wade, who had been at the helm of the library since its beginning in 1929, resigned. She was replaced by Mrs. Maude Lynch, one of the original trustees. Mrs. Lynch served as both librarian and trustee for the next ten years. When Mrs. Lynch died, she was replaced by Mrs. Mary Swain, who served until 1962. 1946 also marked the demise of the library’s elm trees that had been on the property since colonial days. A major windstorm felled two of the six elms. Tree experts confirmed that the remaining trees were infected with Dutch elm disease and should be cut down. The removal was a tricky job due to the close proximity of the library building and the Smith house next door. It took five workers 631 hours of labor to do the job. The elms were replaced with hardier maples. The 1960s marked a decade of major changes at the library. It began with the announcement of a huge endowment from Clark Minor. Clark and his wife, Allice Archibald Minor, established a foundation to promote religious and cultural welfare in their hometowns. 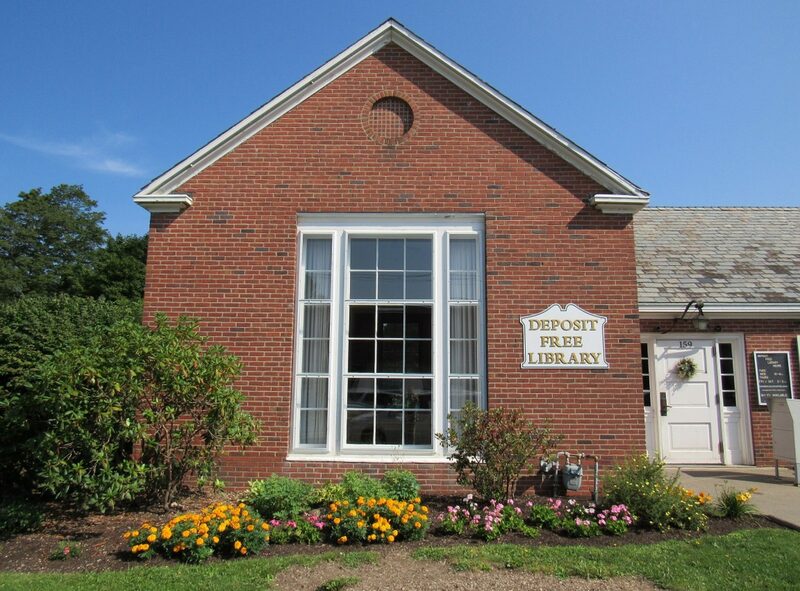 The foundation had three beneficiaries, one of which was the Deposit Free Library. The endowment fund provided $50,000 “to ensure the maintenance and usefulness of the library for many more years to come”. It stipulated that $1,000 be paid each year for 25 years. At the end of that time, the remaining $25,000 would be paid. In 1961 Minor suggested it was time to consider an addition to the overcrowded library building. He offered to finance the construction. The Binghamton architectural firm of Conrad and Cummings drew up plans for an additional two rooms on the back of the building. One was designed as a new children’s room, and the other was to provide storage space for reference and non-fiction volumes. Over fifty years later, the addition still houses the children’s room. The “stack room” is now used for paperback fiction, non-fiction titles, young adult books, and the audio-visual collection. The construction contract was awarded to local builder Alex Zaczek for $20,250. The contract was signed in May 1962, and the majority of the addition was completed by December of that year. Final touches were complete by March 1963. Mrs. Adelaide Clearwater was librarian during this era. She oversaw the reorganization of the library into its new spaces. Clark and Allice Minor attended the official dedication on June 18, 1963. It was the last time Clark spoke at the library before his death in 1967. Minor’s passing was noted in the New York Times, where he was remembered for a lifetime of accomplishments in the international field. But in Deposit, he was remembered as a hometown boy who never forgot his roots and used his great success to benefit the community.